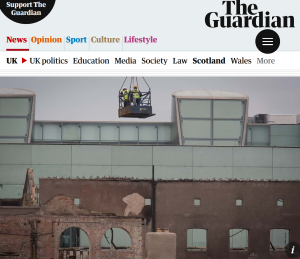 Glasgow School of Art’s Mackintosh building, which was gutted by fire last month, will be rebuilt, the school’s director, Tom Inns, has told the Guardian. Those in favour of bulldozing the site and conceiving an entirely new building have argued that replicating the Mackintosh piece by piece would turn the school into a museum piece. But Inns said the intention was for the building to reopen as a working part of the art school campus.